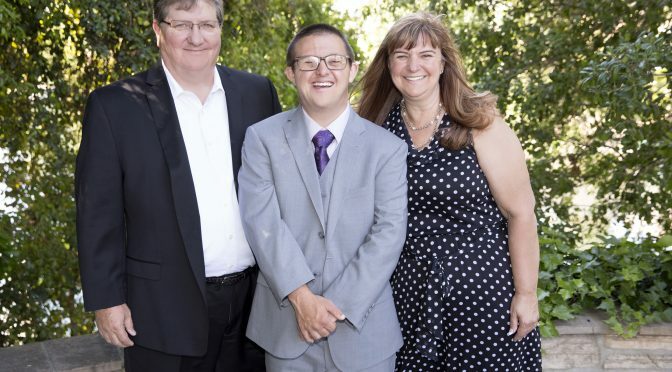 With Season 2 of Born This Way set to premiere Tuesday July 26 on A&E, I was excited to get the chance to ask one of the supporting cast members (the parents) a few of the questions that I’ve heard being passed around our community on social media. Sandra McElwee (Sean’s Mom) is a medical sales professional and published author. She and her husband Rick have agreed to allow viewers into their homes as part of the phenomenon known as reality television. In the six episodes of season one, we got a sense of how closely knit each of the families are and how much the young adults want to be independent. Through the lens of the camera, we got to watch as the families prepared for that eventuality. As a mom, I had questions about the reality of reality television. Sandra graciously agreed to answer a few of them. Me: Considering the history of “reality television” I would guess that, as a parent, you would be somewhat apprehensive about participating in the show. What made you decide to say yes? Sandra: After meeting with the executive producers and them sharing their vision and feeling confident that they would tell Sean’s story accurately and respectfully we couldn’t say ‘no.’ I’ve felt from the beginning that this show would be a ‘game changer’ for people with Down syndrome, and really all disabilities, by removing the fear of the unknown and showing the world the possibilities when the proper supports and opportunities are available. Me: The creators of the show have allowed the cast members to speak for themselves, and they’ve also allowed you as a parent, to speak to other parents. Why do you think it’s important to have both? Sandra: While our desire is for Sean to be an independent adult, it isn’t going to happen without our involvement, support and advocacy. Showing how to support our adults is key to helping families who may not have a large community to reach out to, or who may be in a state where services aren’t readily available and unaware of what they may need to advocate or even lobby for to help their children become independent adults. It’s important that Sean’s voice be the main one though. Because it’s his hopes and dreams that we are supporting. Me: There was a tremendous response to the first season, from within the Down syndrome community and also from the general public. What has surprised you the most about that response? Sandra: The biggest surprise was the very wrong assumptions that the cast have great articulation and the producers only selected people who were (I hate this term) ‘high functioning.’ What they saw were adults who had appropriate social skills—and many misinterpret appropriate social skills as intelligence—and the editors did a great job of sub-titling when some words were unintelligible…and that was so subtle that people didn’t realize they were reading the words. Me: In season one, the audience watched as Sean struggled a bit to understand the rules of dating. How did you feel watching those scenes? Was there anything you wish they didn’t show or something you wish they had? Sandra: Sean learned a lot by watching himself on TV. And his struggle isn’t exclusive to him, so hopefully others learn too. I did try to coach him, but he’s in that stage of life where he knows more than I do, so he didn’t’ listen…how typical is that? Me: What has been your favorite story line so far? Why? Sandra: Christina and Angel’s engagement. I am learning as they go how to support a couple who are heading towards marriage and it’s a great learning experience for me. It seems as though all of us are learning something from this fantastic show! I for one can’t wait to see what happens with the cast, and their wonderful supporting cast, in season 2. Thanks for taking time out of your busy schedule Sandra and good luck at the Emmy’s!